Scientists from around the world are flocking to a small Indian village to try to find out why an extraordinarily large number of identical twins are being born there. One in 10 births in Mohammad Pur Umri, near Allahabad, involves twins, most of them identical. Looking at the faces of Umri's residents, you can be forgiven for wondering if you have stepped onto the set of a sci-fi film on cloning. Globally, the odds of a woman giving birth to identical twins is one in 300. "Over the last 10-15 years, the number of twin births has gone up significantly," Netaji, a village headman who has lived in Umri for over 70 years, told BBC World Service's Outlook programme. "There would have been more, but infant mortality has claimed many lives." For the last six months, when a local daily carried the story about the unusually high incidence of identical twins in Umri, scientists and members of the international media have descended upon the sleepy hamlet. Among the visitors has been a team of DNA experts from the Centre for Cellular and Molecular Biology (CCMB) in Hyderabad. They have been busy collecting blood samples from the residents of Umri, which is viewed as a "genetic gold mine" in the scientific community. Identical twins emerge from a single fertilised egg, while non-identical twins are born if a woman carrying two eggs has both fertilised simultaneously. But scientists remain unsure if twinning is entirely a chance phenomenon. DNA experts hope the blood samples of Umri's residents will provide a clue to whether there is a genetic basis for it, and if DNA rearrangement during the embryonic development is responsible. One theory put forward has been that the high numbers of twins is due to the high numbers of marriages between relatives, which, in the strongly Muslim village, are encouraged. While villagers admit that marriages between relatives are not infrequent, they dismiss the theory that inbreeding is the reason. According to them, marriages between relatives take place in other Muslim-dominated villages too - yet these places do not have as many twins as Umri. "We believe these twins are a gift from God, and nothing else," village leader Netaji said. "The land of this area, between the two great rivers, Ganges and Yamuna, is very fertile. That is why this phenomenon occurs. "Whether it's sugar cane or twin children, this land has always been very fertile." While scientists may disagree with this explanation, many of the other villagers agree. "This phenomenon is partly a gift of nature, and partly a gift of the land of this village," said Abu Saad, a 20-year-old who has two pairs of twin sisters among his eight siblings. "There's something in the soil that produces so many identical twins." Among Saad's eight siblings are two pairs of identical twins - "an extremely rare occurrence", according to the DNA experts at CCMB. 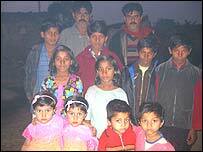 The most celebrated twins in the village are the oldest surviving ones, Guddu and Munnu. Guddu said that even his wife occasionally gets confused between the two - one of a great number of stories of confusion involving the twins throughout the village. "Once my brother had a quarrel with someone in the neighbourhood," Gudu recalled. "When I saw him being taken away by the police, I followed, trying to find out what had happened. "As I approached a policeman, he angrily asked me to accompany him to the station. I told them I wasn't the person they'd first held - I was wearing a white suit, my brother was dressed differently. "But they wouldn't listen. I was only let out when the confusion cleared, a few hours later." The young twins of Umri attract a lot of attention at a nearby madrasa, or Islamic school. A very Indian custom of dressing up identical twins in the same clothes has only made matters worse for the teachers, who find it hard at the best of times to differentiate between the children. The scope for confusion is endless. Meanwhile, scientists in hi-tech labs thousands of miles away from the dust bowl that is Umri will peer down their microscopes and try to match DNA strains, seeking an answer to one of the more baffling genetic puzzles of our times.